I couldn’t believe the words coming out of his mouth. For three and a half years, I’d had a secret crush on this boy, and now he was asking me out. We’d been recess buddies throughout Middle School. Every afternoon we’d walk around the playground making jokes about Ross Perot, Liz Taylor and “The National Enquire.” His braces made him spit when he talked. I wore my bangs pushed up in a way that only lasted until third period before gravity won the battle over hairspray. We weren’t exactly social elite. But now, we were in high school. The rules changed over the summer. And he was sitting in front of me, turned around in his desk, asking me to go with him to the Christmas Dance. Me, the chubby girl whose glasses took up half her face, was being asked out by the only boy I’d hoped would. I don’t remember what I said—recently my mother reminded me that I made an excuse about not being able to afford a nice dress—but I do remember the look on his face as he turned back around in his seat, embarrassed, never to turn around again. That was almost 20 years ago. Today my reasons sound so pale, so hollow but it all felt so real then. I had two sisters, all practically the same age, and going out with a boy was uncharted territory for any of us. If I went first, I foresaw a future of endless, relentless, jealous teasing. Not the jovial kind that makes you red in the face but leaves you feeling loved. This was the epic, teenage girl “I hate you” kind that puts you in tight-fisted tears, heaving from the gut in a bathroom stall. The fear of it was so powerful that my refusal and the accompanying lie were out of my mouth before I could stuff them back in. As soon as I said no I wished he’d ask me again so I could change my answer. But he never did. Not just that day; my playground pal never spoke to me again. As an adolescent, I regretted losing my best friend. As an adult, I regret more that I had hurt him. I don’t know if the truth would have made him feel any better than the lie. But I do know that he deserved the truth. And the full truth that I’d loved him secretly for years...? Well, doesn’t every fourteen-year old deserve to know that someone loves you for who you are, awkward braces and all? These days I favor honesty to a fault. Sometimes it makes people uncomfortable. We’re so used to living in a society of little white lies that little white truths can feel abrasive. But they can be oh so liberating, as well. People look at what I’ve accomplished and have their own expectations of what that means. But when they ask me questions about my success, I tell the truth. And they don’t always like it. I had those same starry-eyed, rosy-cheeked misconceptions before I was published. And if only someone had told me the truth up front, I could have avoided a lot of heartache. But we all want to look successful and work hard to keep those fragile parts of us secret. Those parts that dream too big, want too deep, fear too hard are often the best parts of us, but are the parts we work hardest to conceal. It was some comfort to me then to know I wasn’t alone. But it would’ve been a lifesaver to know before. Today, I’ve been accused of being overly bleak when I talk about making a living as a writer. Sure, there’s the overnight success story—the American Idol tale. It’s certainly the better story. It’s the one people want to tell. The one they want to hear. The one they make movies about. But it’s not the story that most of us live. It certainly hasn’t been my life. So if you want to hear from me, saddle up, cowgirl, because I’ve had to cross a few deserts to get where I’m at. I don’t know if the truth will make aspiring authors feel any better than the lie. But I do know that they deserve the truth. Yes, it’s brutal. It’s exasperating. It’s exhausting. It’s unforgiving, unkind, but utterly, undeniably... alive. And the full truth is...? I love my life as a writer, awkward braces and all. Reader Question: What secret, hidden, vulnerable parts of you have you been reluctant to share? How can being honest about those things improve your writing? Can you put any of that into a character to make them more real and relatable to your readers? 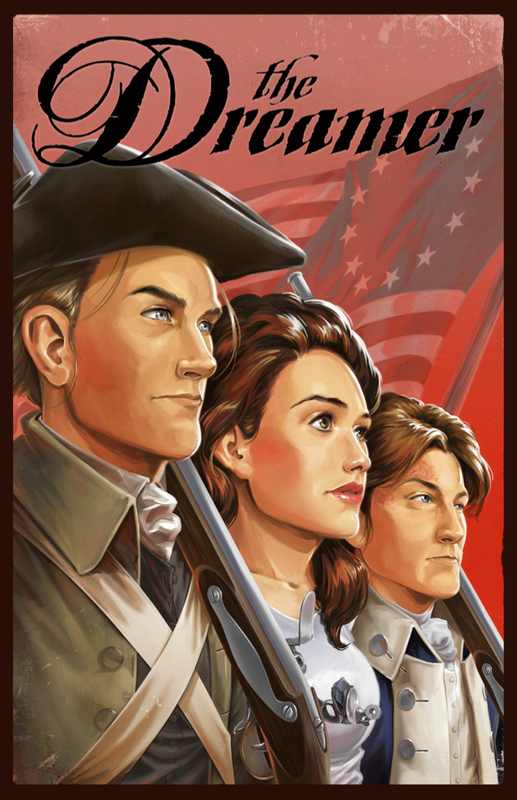 Author Bio: Lora Innes’s romantic, time-travel adventure comic about the Revolutionary War, The Dreamer (IDW Publishing), has been nominated for three Harvey Awards, a CYBILS Award, and is the recipient of the S.P.A.C.E. Prize. The Dreamer Volume 1 is now in its second printing, and Volume 2 was released in November 2011. You can read the comic online at www.thedreamercomic.com where it updates twice weekly. As for your question, I recently added a drug-addicted-absentee-father to my character Veronica’s life. It hits so close to home that I when I write scenes about their relationship I have to walk away from it for several hours afterward. 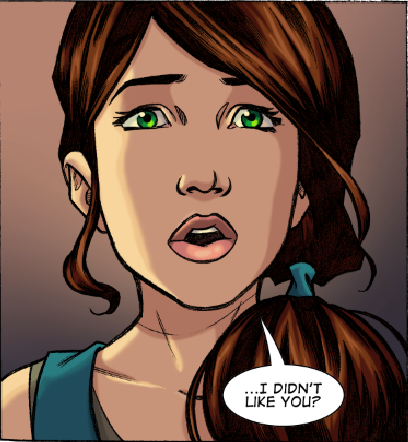 But my hope is that it will read with genuine emotion and my readers will be able to empathize. Thanks again for stopping by and sharing your high school regret with us! Oh my goodness, Lora, your graphics are gorgeous. Simply stunning. And my heart broke a little for your guy friend. Thanks for sharing. As for my vulnerabilities, I don't hold anything back that I know of. I'm pretty open about my mistakes and insecurities, so if I'm hiding anything, it's on a subconscious level. My vulnerability is my lack of confidence. I grew up learning that I shouldn't believe in myself, shouldn't trust anyone, and wasn't worth anything, and even now I still have a hard time shaking that. And it spills over into my writing, both as a trait of some of my characters and as to whether I believe in my own books and believe I can make a career of this. Thanks, Lorie! I'm always nervous with writing fiction that people will assume that *everything* I write comes directly from my own experiences. I admit, I'm guilty of this as a reader: when I see a reoccurring theme in a favorite writer's work, I start to wonder if they're writing about their own life. But I think great writing is inevitably honest, in its source, even if not in the details. I write about war a lot, and I've never been a solider! But I have seen a lot of people love and suffer great loss, and I have as well. Sometimes when my husband comes home from work, I'm gloomy for "no reason." Then I realize I just spent the day writing about the death of a character I love. And where did I get that from? Thinking about the people I've loved and lost. No wonder I feel heavy! I'm glad you've been able to do that even if it's difficult... I'm sure your readers will be glad as well. Melissa, thank you! I was an artist before I was a writer, but now I'm becoming more of a writer than an artist, lol. Jo, sounds like you had better reasons than me! I was just a coward. On that note, I've found that despite those feelings of insecurity, you just keep doing it. Some days you feel top of the world, some days you feel like a hack. But it's the "don't stop" attitude that pays off over the long run. Feelings are real, in the sense that we feel them, but they don't necessarily reflect reality. Ever get mad at someone for something you thought they did, but didn't? The feeling was real, the reasons for it were not. Same with our insecurities. In my own life I found that at first I was reluctant to share my writing with others. And then, let my best friend read my issue #1 script. And you know what? She started laughing at all the funny parts. And in that moment, I knew I was onto something. What I had written worked. The more you share it, the more people respond, the more your confidence grows. And in this amazing day and age we live in? We don't need a publisher or an agent to tell us we're good enough. We just need to go out and get the readers ourselves. The rest of that follows. Find people who love your story and you're more than half way there. I'm so glad you put that doubt into your characters because we've all felt that way at one time or another. I love strong heroines in stories, but I'm not always one in my own life. And sometimes it's nice to connect with a character who has dealt with the same things I have. Because when *she* overcomes, I feel like maybe I can too. Lora, your graphics are beautiful! Great post--inspiring and encouraging. Hi Lora! I'm a big fan of your work. Ever since Lorie turned me on to you. If my literary project ECHOES OF NEVERLAND ever gets sold and I can afford you, I plan to come begging for some illustrations. ;) I'm so excited to hear about your upcoming Civl War tie-in! Thanks for being a guest at honestly YA. Great post. I generally don't hold back unless it's going to harm others. Don't you hate living with regrets? Those high school years are chalk full of them. Those teen years were just so hard. Great post! As a mom, I have a hard time explaining kindness versus white lies. And the worse culprit, lies by omission. Wonderful story, amazing graphics. Very inspiring. Thank you for sharing.